I first visited the Hawaiian islands in the early 1980′s and fell in love with the islands. I love their cuisine especially their seafood dishes including Ahi Tuna which was prepared many different ways from poke to stewed in coconut milk. Native Hawaiians used to fish for tuna using their wooden ocean faring canoes. They would use jungle twine as fishing line and bones in the shape of fish hooks. When they hooked up a tuna, the powerful fish would run the line out so fast that when the line draped across the wooden canoe, the friction set the canoe on fire. They would have to douse the fire with seawater. 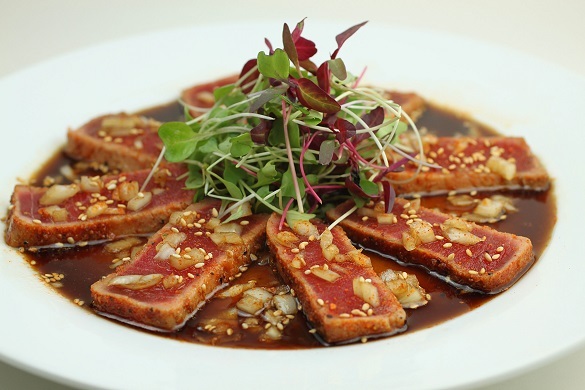 Ahi is the Hawaiian word for fire, hence the name Ahi Tuna. The tuna is actually from the yellowfin tuna species and the yellowfin from Hawaii has a characteristic deep crimson red color. I make this dish whenever I miss the islands. My recipe was featured in a Hawaiian magazine in the 1980′s and has become one of my signature dishes as it is a crowd favorite even among those who shy away from raw fish. On Season One of TLC’s BBQ Pitmasters, I served it to Johnny Trigg, a Texan world champion pitmaster on the show who had never eaten raw fish before. It is easy to prepare when you entertain as you can sear the tuna, slice it, and then plate it. Cover with saran warp and store in fridge. When your guest arrive, you can pour the dressing on and serve immediately. Soak tuna overnight in ziploc bag drizzled with extra virgin olive oil (this secret step will tenderize the tuna). Dust with medium sprinkling of SYD rub. Sear on hot saucepan 60 seconds each surface. Pour dressing on serving plate. Slice tuna about pencil thick and lay in circular pattern. Garnish with radish sprouts and sesame seeds.